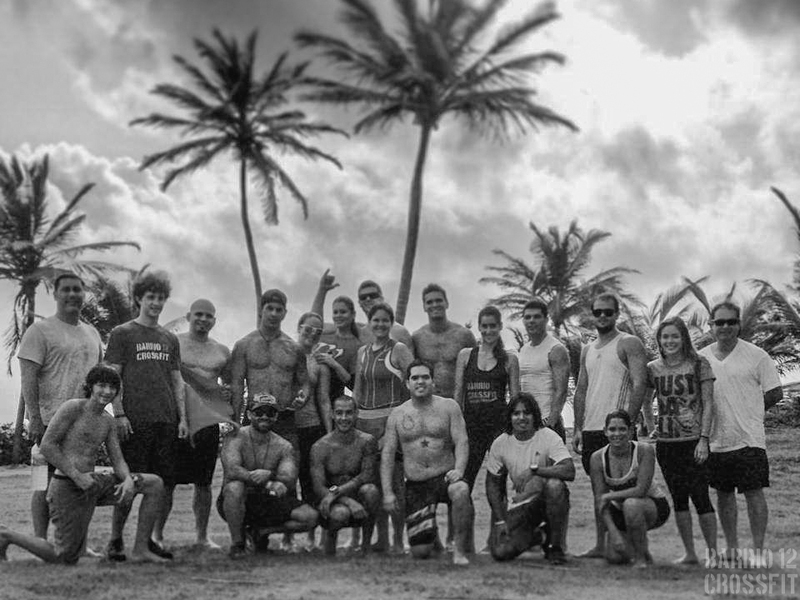 Barrio 12 Crossfit is a family based business owned by Jose Mendizabal A.K.A Mendi and wife Ileana Iguina. Our history started on March 2012 after Jose completed his last Triathlon. Coach Mendi decided to look for other sports that did not sacrifice time from the family like long distance triathlon did. Thanks to a great friend and martial arts mentor Coach Ruben Rivera, the first Level 1 Crossfit Coach in Puerto Rico, opened up his doors and started coaching us in the privacy of his own home. After Jose completed the CF Endurance Seminar him and his wife started their long quest of CrossFit training. They decided to start small and commenced their soon to be passion for CrossFit out of an Auto Shop they owned in Santurce. Soon friends and family started to join in, and slowly a community was born. They were well aware of the potential and impact this passion they had would have on society and together they decided to take it one step further. On October 2012 they took the CrossFit Level 1 Trainer Course with the intention of becoming a CrossFit Affiliate. That dream came to a reality and it is now what they call "Barrio 12 Crossfit". Why "Barrio 12"? Well, thanks to fellow athlete and long time friend, Manny Morales, came up with the name "Barrio". "Barrio" is a term used in the spanish culture in reference to a community or neighborhood. The simplicity that comes with a CF Box and the meaning of "Barrio" share some of the same characteristics, also that sense of "family feeling" once you enter their box and humbleness that each athlete experiences every day of training. The "12" is in memory of the year their passion started and el "Barrio" was born. Today Barrio 12 Crossfit has expanded and moved its facilities to a 4,000 sq ft warehouse, but they soon discovered they wanted to give their clients more, and were well aware their athletes were hungry for more. Their facility will now be close to 7,000 sq ft and they will be offering a variety of programs that are in alignment with CrossFit, including CF Striking, CF Kids, and Barrio 12 Fit. Our mission with our CrossFit family and the people we may touch along the path is to open their eyes to a new "you". Once you enter the box weather you are young, old, fit, or have never touched a weight in you life you will realize you are capable of doing and performing things you have never in your life imagined you could accomplish. You will meet and exceed your own expectations, conquer new goals and open the doors to a better "you".